Whenever we see one of those vintage tube ads for 'Brightest London' we want to slip on a pair of spats, pour a large sidecar and race a brilliant yellow Duesenberg back to 1929. Thing is, central and west London are still dripping with art deco architectural gems; you can still wander down the Strand on an art deco walking tour, and you can still slurp that cocktail in an original art deco bar. 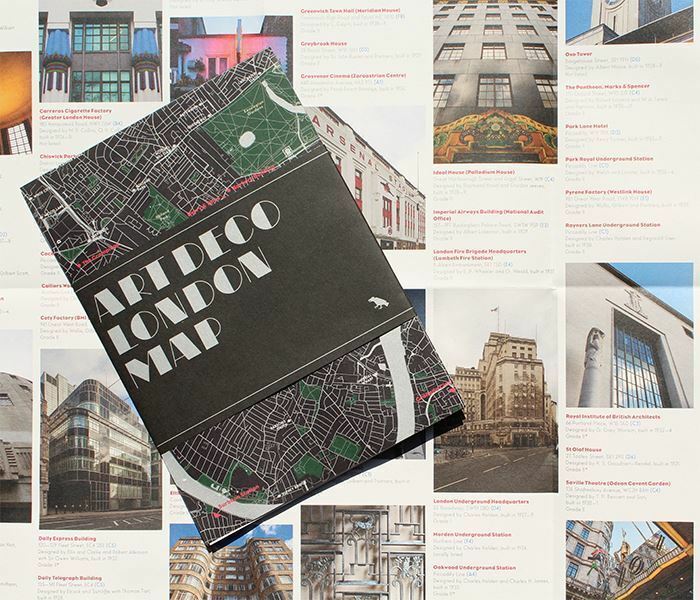 One of the reasons for the survival of many of these buildings is the Twentieth Century Society, which also happens to be one of the names behind this new Art Deco London Map. As you'd hope for a map that's a paean to one of the swishest aesthetic movements in history, this looks good. A black background is punctuated with racing green-coloured parks, while a fat, silvery Thames rolls through the middle. The architecture itself — an eclectic range taking in tube stations, hotels, cafes, lidos and football stadiums — are punctuated in red, and make an interesting visual point: most of London's art deco beauties were in central and west London, with only the odd exception elsewhere, such as the Troxy in Limehouse, and Eltham Palace way down south east. The map's flip side provides colour photos and short descriptions; for those who already know a bit about art deco London, you probably won't learn much new. But it's still worth taking with you for a weekend mooch around the West End, or you can always just frame the map and slap it up on the wall. As with the map of brutalist London in this series, there's a slight gripe, in that the span doesn't cover certain classic art deco buildings (Perivale's Hoover Building, a host of Piccadilly line stations). Aside from that, this is spiffing stuff, old sport.